The idea of your smart phone dock saving your life is funny, if not ironic – typically your smartphone distracts you from everyday situations. 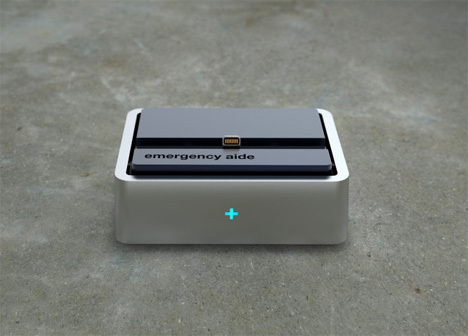 A new “emergency aide” has been created to enhance your dwelling’s fire safety system. And it’s all based around your smartphone. Sense+ is an interesting new piece of smart phone hardware. 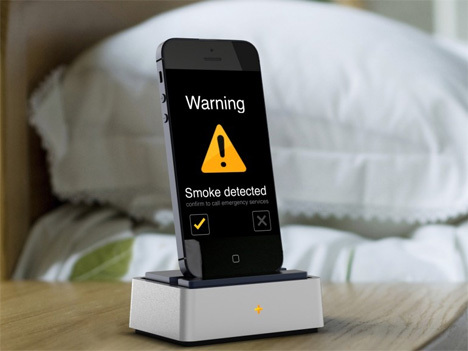 It’s a docking station that works with your current ceiling-mounted smoke detectors. Rather than replacing them, it enhances their abilities. Standard smoke alarms detect only ionized smoke, which is from fires that are already flaming. Sense+ has a built-in photoelectric smoke sensor that can detect smoldering fires before they’re out of control. All the detected information goes through an app, which alerts the owner to the danger. If there is no response, the app automatically calls specified emergency contact numbers. And it also detects carbon monoxide, an odorless gas that makes people sleepy and can be fatal. Just don’t forget to plug it in. See more in Unbuilt Concepts or under Technology. July, 2013.